Please see a movie about Frösövallen here! Frösövallens story begins with a man named Per Olof Persson from Östersund. He needed land for fodder and grazing for their horses and therefore bought the property Michaelmas Farm sometime around 1915. He found the place at the top was a nice outing and decided to build a house there. The house he built with his son Sven O Persson, a man who was to become one of Jämtland’s top entrepreneurs. In the mid 1930s, was the house finished. Artist Paul Jonze was with and painted the house and another jämtland artist Acke Aslund had his studio there for a shorter time. A painting of him still adorn the cafe Frösövallen. The house was later owned by Martha Wikstrom, sister of Sven O Persson. She offered the Swedish Tourist buying the house, but they declined. When Mrs Wikström were told that the EFS cabinet secretary, Jonas Andersson, searched for suitable premises for warehouse and youth activities, she offered him to buy the building. Jonas Andersson had to borrow the key and together with the preacher Olof Samuelsson, he went out to see the place. It was a beautiful day in March 1942. They were pulsing in the snow up to the house, and after coming in and looking around, they stopped in the main cabin. On the table lay the Christmas period which they themselves helped to give out, “at Christmas in the mountains”. This they saw as God’s guidance. Then they both went up the stairs to the upper floor. There, they saw that the great hall was built as a church. “Everything’s built for us,” noted the two coherently. When Jonas came back to the office he rang up Mrs Wikström and said that he wanted to buy the building. The same day, formed an association with Jonas Andersson as chairman. He contacted the bank immediately granted a loan. The newly formed association bought the house for 17.000 SEK. After the purchase made he started with the renovation work and could already in the spring to have the opening party. A competition for the best proposal for the name of the summer home was announced. Anna Simonsson-Moberg won with the name “Frösövallen”. In the year of 1945 was the “Camp cottage” erected which was originally a barn. The building has since been repaired and improved several times. While the main building has been renovated several times. In 1986 they built the kitchen and stairs to the upper floor. The entrance was moved to the western side and the patio was in order. In 1992, when Frösövallen celebrated its 50th anniversary, inaugurated the newly built service house. 2001 built storage between service building and hostel and 2004 was renovated upper room in the main building. Of 2008, a building with staff rooms and guest toilets and a year later made an extensive renovation of the kitchen. In connection with the construction of the new assembly hall has also been an expansion of the old patio and extensive land use planning. In autumn 2010 began construction of the assembly hall, and it was inaugurated June 9, 2012 while Frösövallen celebrated its 70th anniversary. 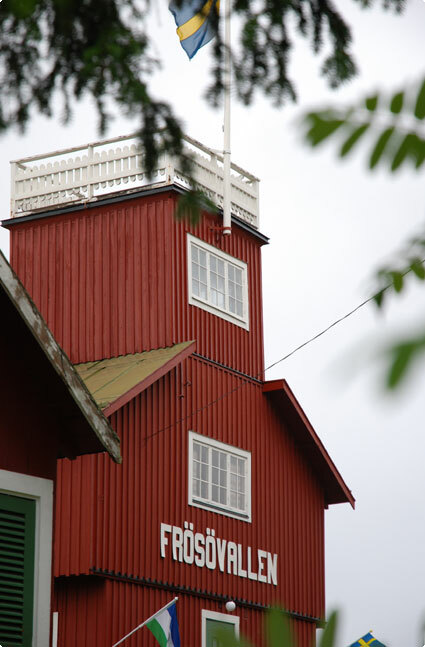 Frösövallen is now owned by the EFS Mission Society in Östersund. During the summer, EFS compound their worship services and other gatherings where. Frösövallen also runs a popular summer café, which is open daily from early June to late August. The former camp hut is converted into a hostel. The operation of the cafe and the hostel as well as the management of the facility conducted by both employees and many volunteers. The closeness to Frösö Church and Wilhelm Peterson-Berger “Sommarhagen” as well as the peaceful and beautiful environment, making Frösövallen to a fine tourist destination and accommodation in Östersund area. The re-open pilgrim trail, Saint Olav trail, passes next to Frösö church and Frösövallen. 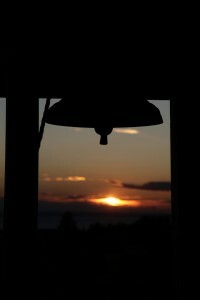 Frösövallen has been fitted with a pilgrim stamp and may in the hostel offer overnight for hikers on the trail.